The Austrian chancellor says "Europe is especially interested in cheap and stable gas supply"
ST. PETERSBURG, October 3. /TASS/. 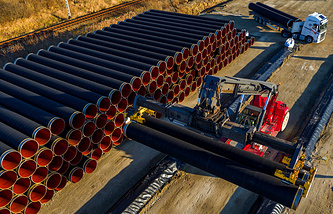 European countries that participate in the Nord Stream 2 gas pipeline project are interested in its implementation and fully support the construction of the pipeline, Austrian Chancellor Sebastian Kurz told the press conference after talks with Russian President Vladimir Putin. "I want to assure you that European countries that take part in this project [Nord Stream 2], fully support it, have a positive attitude toward it and want to implement it together. At the same time, we need to clarify some legal issues. and it is important for us that Ukraine's interests, as a transit country, are considered," Kurz noted. "We agree that Europe is especially interested in cheap and stable gas supply, and such need exists if we want to ensure energy security. We think that in order to guarantee energy security, we need several energy sources. It is also rational to determine various energy routes. That is why we in Austria support the Nord Stream 2 project. Our European partners who take part in it, support it as well," he stressed.